Marlboro makes a jump in our rankings after topping CMass power St. John's (Shrewsbury). Photo by Ryan Bowman. 1. Cambridge (4-0; Last Ranking – 1): Falcons made mince meat of their conference opponents last week, but will face two tough opponents at the BABC Holiday Tournament in Portsmouth (N.H.) and St. Raphael’s (R.I.). 2. BC High (3-0; Last Ranking – 2): So far this year, the Eagles have defeated three very good teams by an average margin of 21.6 points. Talented point guard Travis Evee and star wing Carl Pierre provide the foundation, but this is a very deep BC High team. 3. New Mission (3-1; Last Ranking – 3): The idle Titans are preparing for their annual trip down to Florida over the Holiday break. More often than not, Cory McCarthy’s squad comes back from that road trip as a stronger unit. 4. Mansfield (3-0; Last Ranking – 4): Hornets are taking a page out of New Mission’s playbook with a trip down the Key West and the Everglades this week. Then they’ll prepare for a potential D1 South Finals preview against BC High on January 4. 5. Catholic Memorial (3-0; Last Ranking – 5): Still creating turnovers with their chaotic defense, the Knights are certainly a contender in D1 South and they’ll look to prove it with matchups against Lexington and either Newton North or Newton South on tap this week. 6. Franklin (3-0; Last Ranking – 6): Panthers were tested a bit in a 67-55 win over Foxboro, but remain atop the Hockomock Kelley-Rex Division alongside Mansfield and Attelboro. 7. Everett (3-0; Last Ranking – 7): The Crimson Tide will look to showcase their high-powered offense this week during tournament games against Belmont and Bishop Stang. 8. Brighton (2-0; Last Ranking – 9): Brighton’s 98-95 win at O’Bryant was an instant classic that should help a relatively young team figure out what it takes to win close games. After a road game against storied program St. Anthony’s, the Tigers will return home to prepare for their huge game against New Mission next month. 9. 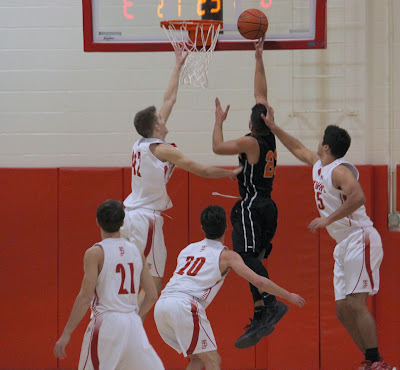 Marlborough (4-0; Last Ranking – 12): Chris Doherty flirted with a 20-20 game and Joao Mendes led all scorers with 19 points as the Panthers won at St. John’s (Shrewsbury) for the second consecutive season. 10. St. John’s Prep (3-0; Last Ranking – 10): The Eagles have been impressive during their nonconference schedule and they’ll look to close it out with wins against New Rochelle (N.Y.) and Boston Cathedral before opening Catholic Conference play next month. 11. Newton North (1-1; Last Ranking – 11): Head coach Paul Connolly has had a long lay off to work with his players after a rough start to the season. If the Tigers drop a rivalry game against Newton South on Wednesday evening, then we’ll know they’re in trouble. 12. Central Catholic (2-0; Last Ranking – 13): The Raiders hung 90 points in a win over Londonderry (N.H.) and appear to be doing just fine without transferred stars Tanahj Pettway and Kevin Fernandez. 13. Brookline (3-0; Last Ranking – 19): Chris Camille, Mark Barrett and Wesley Delvar led the Warriors to a narrow early-season win over Bay State Conference power Braintree. This youthful squad continues to show that talent can trump experience at times. 14. Lowell (2-0; Last Ranking – 14): Red Raiders had no trouble with Dracut in their second game of the season and will test their mettle in tournaments over the Holiday break. 15. Needham (3-1; Last Ranking – 16): Rockets have bounced back from a blowout loss to down conference foes Natick, Framingham and Newton South by comfortable margins. 16. Springfield Central (3-0; Last Ranking – NA): They took down Amherst and flexed their muscles with a 102-35 win over Westfield while incumbent power Springfield Putnam dropped two decisions, so it’s safe to call the Golden Eagles the new top dog in Western Mass. 17. Malden Catholic (3-0; Last Ranking – 17): The idle Lancers looked great over their first three games and should be well rested ahead of a big matchup with Franklin on Dec 27. 18. Metheun (3-0; Last Ranking – NA): Kevin Fernandez is leading his hometown team to a great start and the Rangers will look to ride that wave into a tilt against Andover. 19. Weston (5-0; Last Ranking – NA): It seems as though the Wildcats could serve as the biggest challenger to Cambridge for Dual County League supremacy. They’ve won four straight games by double figures and might go into a January 10th tilt at the Falcons undefeated. 20. Concord-Carlisle (1-1; Last Ranking – 20): The Patriots got out of Boston Latin with a narrow 69-64 win and will have to be on their game if they want to hang with BC High on Dec 31. 21. St. John’s (Shrewsbury) (3-2; Last Ranking – 15): Consecutive losses to regional rivals Nashoba and Marlboro have the Pioneers rapidly falling in our rankings. 22. Braintree (1-0; Last Ranking – 21): Nick Timberlake filled it up with 32 points but the Wamps fell, 60-57, at Brookline to suffer their first loss of the season last week. 23. Maynard (2-0; Last Ranking – 23): The Tigers held serve with a 50-40 win over Clinton last week and seem quite capable of making a run back to the D4 State Title this year. 24. St. Mary’s (Lynn) (4-3; Last Ranking – 18): The Spartans continue to battle during a challenging nonleague schedule, and that should only make them stronger when it comes time to defend their Division 4 State Title this February. 25. Bridgewater-Raynham (4-0; Last Ranking – NA): Trojans took down a Catholic Conference foe in Xaverian and they might be able to make some noise down south.